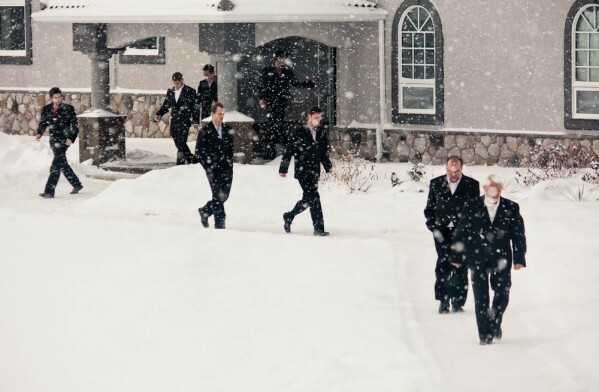 Hutterite men walking home from church on a snowy Sunday morning. Leaving Church Photo by: Kelly Hofer Hutterite men walking home from church on a snowy Sunday morning. 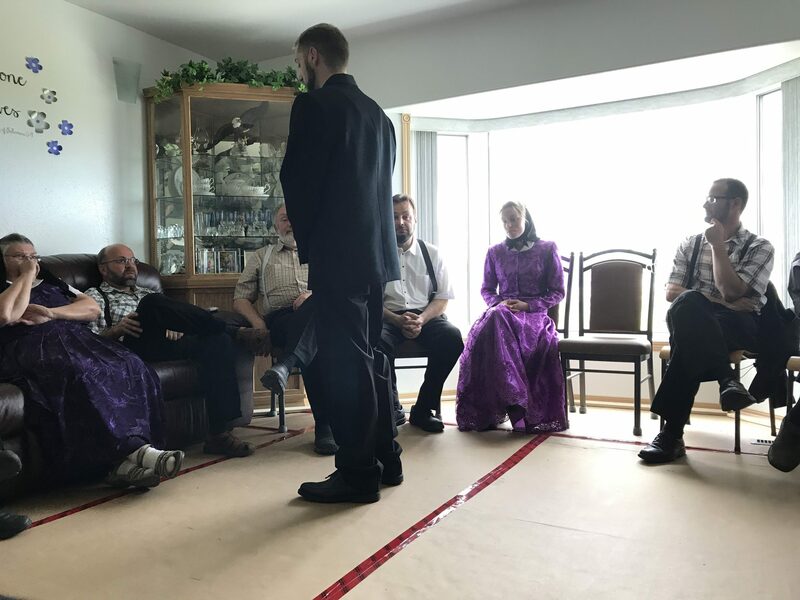 'Aufredn' Photo by: Clint Stahl The formal occasion where the gentleman asks the parents of his bride-to-be for their daughter's hand in marriage is know to hutterites as "aufredn". The picture explains the process quite well, as this gentleman stands in front of 'her' parents, getting their consent to marry their daughter. Once her parents and her colony give their consent, the engagement is official and wedding arrangements can be made. Church Services Photo by: Reto Vetterli A view from the back during 'Lehr', the weekly Sunday morning church service. Sermons are in German, as are the songs from the traditional hymn book: Die Lieder der Hutterischen Brüder. 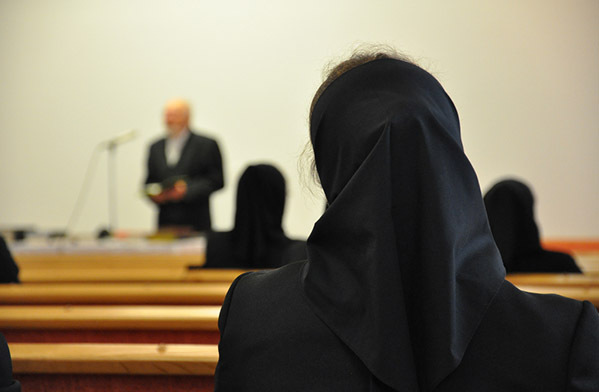 Men and women sit segregated according to age, with the ministers and deacons seated at the front. Baptismal Preparations Photo by: Kelly Hofer Part of the process of baptism includes visiting each colony deacon in the six to seven Sundays leading to baptism where the baptismal candidates are instructed on spiritual and religious doctrine. 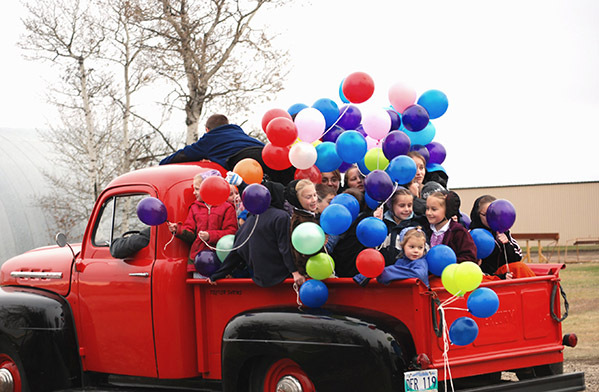 Children's Choir Photo by: Lenita Waldner Singing as a form of worship is encouraged and practised from an early age. 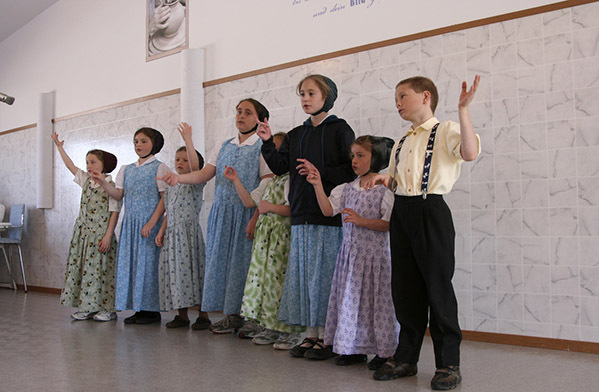 In this photo, a small group of children are performing for the community members after Sunday dinner. Welcoming Committee Photo by: Lisa Waldner One of the wedding highlights for the children is driving out to meet the bride and her entourage, exuberantly leading her into the colony where the community has gathered to greet her. 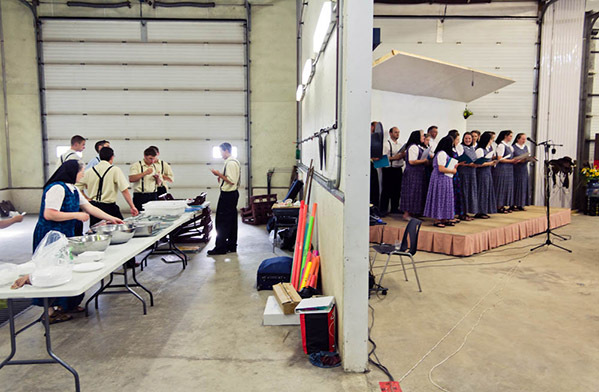 Anticipating Arrival Photo by: Lisa Waldner Hutterite brides move to the groom's colony after marriage. Prior to the wedding, the groom escorts her to their new home where community members gather to welcome her and the wedding guests. Wedding Decor Photo by: Lisa Waldner The communal dining-room prepared and ready for the wedding supper. Here Comes the Bride Photo by: Lisa Waldner Flower girls peer into the church as they eagerly wait for the bride and groom to emerge after the ceremony. The Two Sides of a Wedding Photo by: Kelly Hofer Space can be a problem when hosting large events such as weddings. The garage had to be utilized for this occasion. Tables on the left are arranged for serving guests; on the right a choir is performing for an invisible audience. 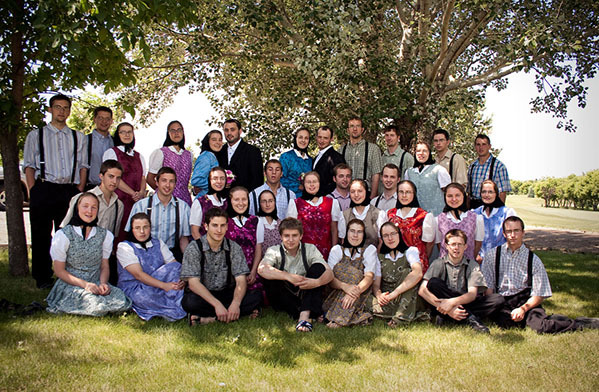 Man and Wife Photo by: Kelly Hofer Hutterites marry for love - for life. The Last Group Photo Photo by: Kelly Hofer Dressed in traditional bridal blue on their wedding day, the two brides pose with the friends they will leave behind when they move to the grooms' colony.